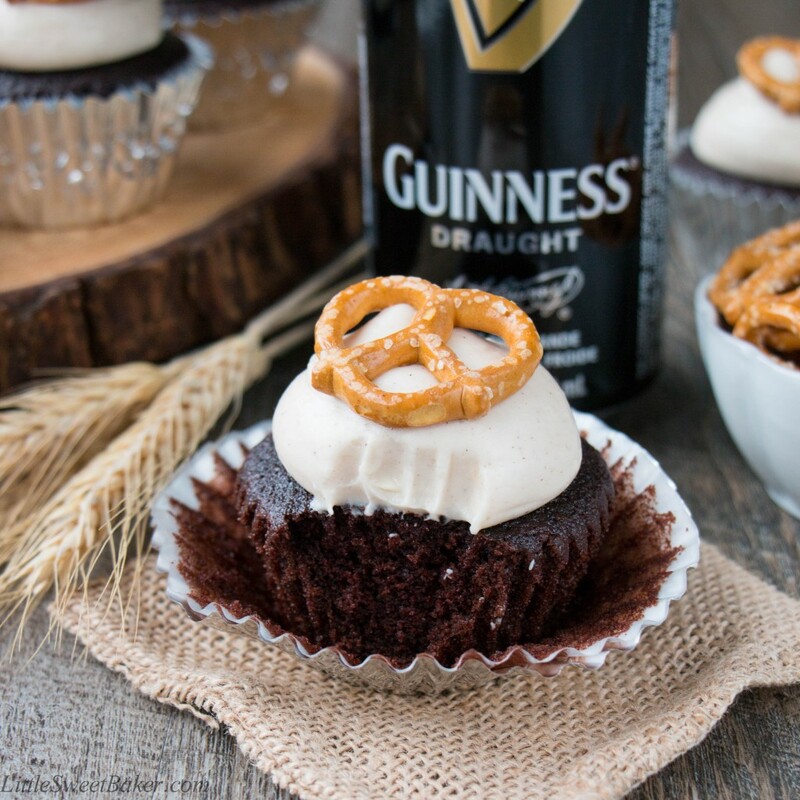 These delicious Guinness cupcakes are moist, chocolatey, and boozy. They are topped with a maple cinnamon cream cheese frosting and salty crunchy pretzels. 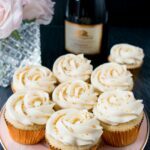 I’m going to start off by saying that what I love about this recipe is that you can really taste the beer in these cupcakes. 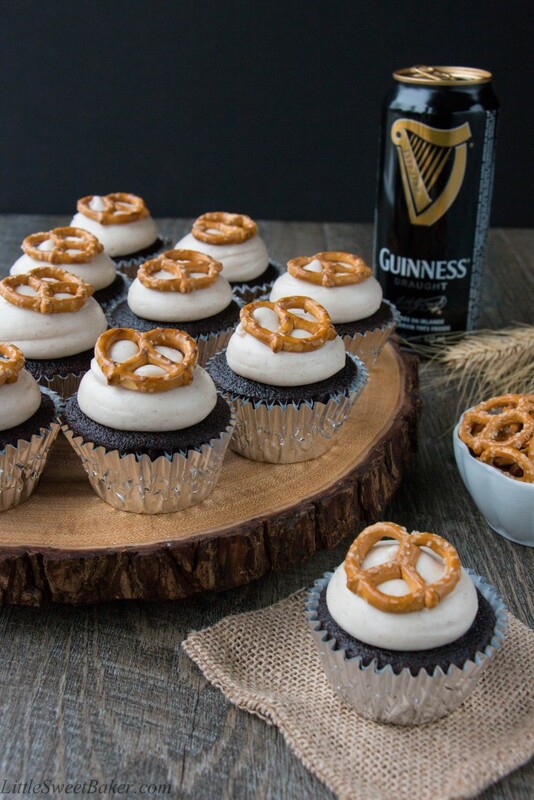 I mean, that’s the whole point of adding booze to a dessert, right? 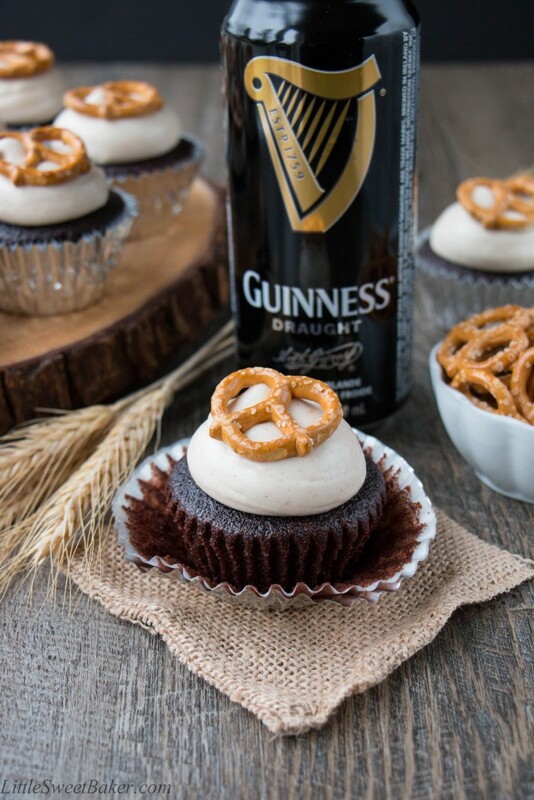 And this is coming from a person who doesn’t even like beer, but the stout adds a interesting depth of flavor to this dessert. There is a soft subtle bitterness from the hops, a natural sweetness from the malt, and a smooth bite from the alcohol. Also, the dark roasted coffee notes from the draught beer complement the rich chocolate flavor oh so nicely. The cupcake is soft and tender in texture, bold and chocolatey in taste. 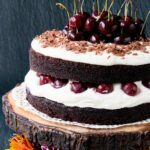 The frosting on top is sweet and tangy with a smokey maple flavor and hint of spice. The mini pretzel on top is not only for decoration, but the salty crunchiness along with the sweet creamy frosting is amazing on your taste buds. 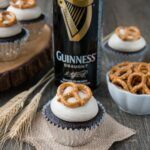 Whether you are a beer fan or not, you are going to love these Guinness cupcakes because of all their unique bold flavors. You’ve got the sweet and salty, chocolate and full-bodied dark beer, maple and spice, and everything nice. 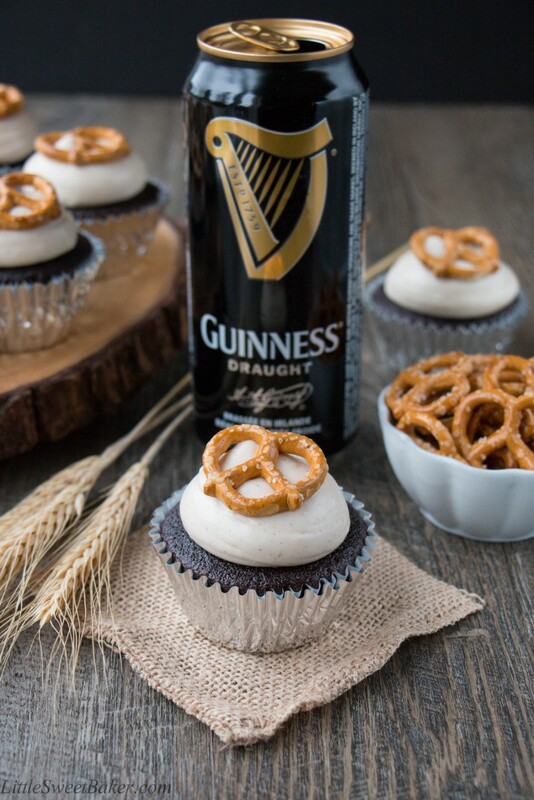 This dessert is perfect for any St. Patrick’s Day celebration, backyard barbecue or social gathering because nothing says party like beer and cupcakes! Cupcake recipe adapted from Serious Eats.